Giving parents a compass for navigating family dissolution, Spare the Child guides parents and families through the difficult and often overwhelming task of restructuring a family. The documentary-style, conversational video uses everyday language and gives examples from experienced interviewees. Judges, lawyers, guardians ad litem, counselors, teachers, and children of divorce relate their experiences and observations to guide families who are currently in the process of family restructuring. Running time nineteen minutes. Spare the Child is a project of the Virginia State Bar Family Law Section through a generous grant from the Virginia Law Foundation. For a DVD version of the Spare the Child video, please contact Dee Norman at (804) 775-0594 or dnorman@vsb.org. The original edition of Spare the Child was designed to be shown to parents contemplating custody litigation. It was distributed in 1997 to courts around the state for use in mandatory litigant-education programs, with additional copies made available to the public. With 30,000 divorces yearly in Virginia, use of the Spare the Child video program was widespread, and this very popular video gave parents the foundation for navigating a divorce without creating undue strain on children when handling visitation, custody, and child support issues. It stresses the importance of divorcing parents keeping the best interests of their children in mind. Used in many statewide programs, including parent education programs required by law under Section 16.1-278.15 of the Code of Virginia, which requires parents and/or all other parties involved in a contested custody, visitation, or child support petition to attend a parent education class, Spare the Child is frequently requested from the bar not only by divorcing individuals but also by churches and community groups to use in parenting programs. The video is also used in family law programs in law schools as a part of the curriculum, assuring that the commonwealth’s newest family lawyers will be bringing the qualities of the Spare the Child video into their practices. Additionally, many judges in family and juvenile courts require divorcing parents to watch the Spare the Child video to encourage mediation. The 2010 version of Spare the Child includes updates such as formatting for DVD and web streaming, greater diversity, views of family dissolution of cohabiting as well as married parents; and additional options in collaborative family law and other dispute resolution approaches that are now available. The latest version also has a Spanish option and closed captioning options in both English and Spanish. 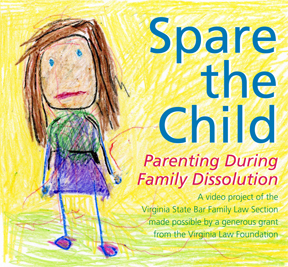 The 2010 version of Spare the Child is a project of the Virginia State Bar Family Law Section through a generous grant from the Virginia Law Foundation.